The Sun held off the Mercury, 96-95. President Obama honored the 2013 WNBA Champion Minnesota Lynx at the White House today. Coach Lin Dunn reflects on 44 years of coaching, and fighting for equality for five decades. Dunn paved the way for today’s generation. Elena Delle Donne didn’t travel with the team to Washington D.C., staying behind to receive treatment for Lyme Disease. Chucky Jeffery tries to find her niche with New York. WNBA president Laurel Richie visited Indiana last night. …have added Big Tigger as an in-arena co-host. The function of assistant coach Shaq Williams. 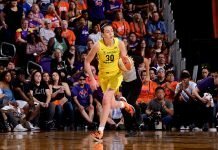 Jon Samuelson – father to Bonnie, Karlie and Katie Lou – is an “out of sight” dad. Laquanda Dawkins is a new assistant coach at Tennessee Tech. New assistant coaches at Utah Valley State are Vicki Bohney and Adam Wardenburg.